I'm keeping it REAL simple this week! Summer is in full force and I'm in no planning mode! So we'll be singing He Sent His Son (February's program song) along with Daddy's Homecoming. If you want to see all of my Father's Day posts, you can find them HERE. We'll just quickly stand and review He Sent His Son and then pull out my Dad Puzzle found HERE to review Daddy's Homecoming. Easy! "Easy prep, just prepared a lot of ties, and drew a bunch of different Dad's on the board, a variation of some other ideas I've seen in the last couple of weeks. I scattered the ties around the room, and would pick a kid to put a tie on a Dad, and on the back of the tie would either be a review song, or a silly way to sing the month's current song. I estimate the prep time taking 20 minutes. Make sure you have some "manly" tie colors. The boys just don't want to pick pink, yellow, or purple ties." Thanks for sharing!! 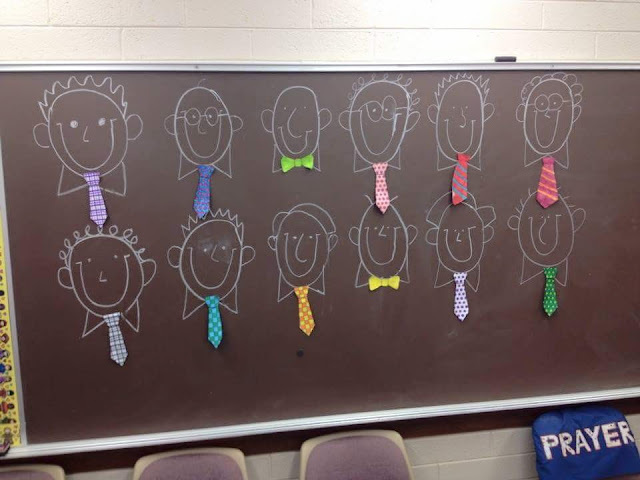 You can find some downloadable ties HERE or HERE or simply cut some out on scrapbook paper and save your printer for another lesson :).